If Elvis knew about probiotics, he might still be alive today. For millions of Elvis fans (myself included), that’s a pretty bold statement. 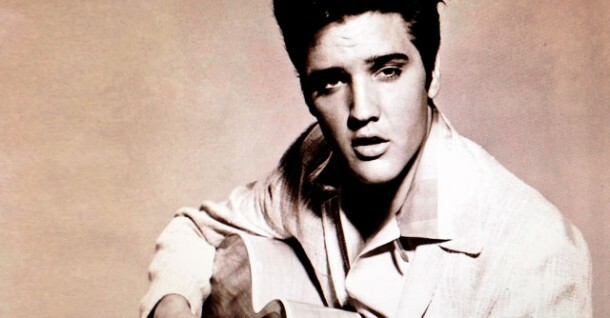 Probiotics are the key to gut health and what most people don’t know is that Elvis has a horrific time with his digestion — it plagued him for most of his professional career. In fact, his last trip to the bathroom was the catalyst for his passing — a massive heart attack according to the book Gulp by Mary Roach. She talks in detail about Elvis’ drastically enlarged colon and many other gory details about his stomach issues that you don’t hear about in the rag mags. The sad truth is — Elvis’ death was brought on by a horrible diet along with other bad habits. We know for a fact that the “King” didn’t sip fruit yogurt smoothies or munch on high-fiber salads, but if he would have been good to his gut, would it have saved his life? Until recent years, the health of your digestive system (including your stomach, large and small intestines) has been mostly ignored. The #2 and #3 prescribed medications in America are both to control digestive upset, but these medications don’t look at the root problem. When your digestion is out of balance, your whole body suffers, and medications simply cover the pain, they don’t restore the balance. A complex system of microbes, called the microbiome, inhabits your large intestines and it’s a powerful yet tiny world — think of Mad Max Beyond Thunderdome, where good and bad microbes (also called bugs) duke it out in the arena of your large intestines on a daily basis. So why do the “bad guys” sometimes outnumber the good? Stress, poor diet, lack of sleep, eating high doses of sugary foods and poor quality fats, drinking too much alcohol, and not replenishing probioitics with cultured foods (because we can get the “good bugs” only from food sources) can all tip the balance. So why should Elvis have known more about probiotics? First off, the good cultures, sometimes referred to as bugs, are at the heart of your immune system — because they trigger immune response. Secondly, they are responsible for synthesizing important nutrients from our food like B vitamins, especially choline, a super vitamin for healthy brain function that may help you avoid blue moods. Probiotic cultures have also been shown to help us manage daily stress that cause stomach flare-ups, perhaps the kind that Elvis might have felt before hitting the Vegas stage for one of his big gigs. But what of Elvis’s legendary craving for sweet sandwiches like peanut butter with banana or Italian subs with grape jelly? Experts say that an unbalanced bacterial eco-culture in your gut (meaning an overgrowth of harmful bacteria) can be responsible for sweet and alcohol cravings because they feed the harmful bacteria such as candida. Lack of the good bacteria may have a role in obesity and possibly the reason why some people find it impossible to lose weight. Taking excessive amounts of antibiotics can be another way to wreck your gut — some studies even say that gut balance may predict whether a person has a likelihood of contracting diabetes. Eating foods like kefir, pickled vegetables such as kimchee, olives and plain low-sugar yogurts can be a tasty way to supplement your healthy eating regime. If you can tolerate dairy well, then plain, unsweetened kefir is my favorite probiotic food because it’s low in sodium, high in protein, and tastes just like yogurt. Most grocery chains carry kefir and you’ll find it in the dairy isle, right next to the yogurt. Traditional kefir is a fermented milk product which contains a blended mixture of several live probiotics, instead of just one or two that you’ll find in most commercial yogurts. Some kefirs contain up to 10 different live cultures (check the label to be sure) which is important since it’s hard to know which probiotics fare the best in your system — apparently everyone’s bacterial jungle is different! Plain kefir is versatile, I use it as a base for my daily morning breakfast smoothie and just add in whatever fresh fruit I have on hand and also mix in superfood vegetables like spinach or kale. Just don’t heat it (or any probiotic food for that matter!) or you’ll kill the cultures. 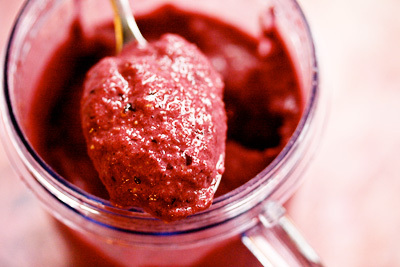 This shake is great for a fast breakfast or mini-meal. Freezing or chilling kefir does not harm the probiotic cultures, so this shake can also be turned into yummy frozen pops, or frozen in a paper cup for a shake on the go! Ground flax gives an added fiber boost and a nutty flavor to boot. Store flax in an air-tight container in your fridge to protect the delicate fats from going rancid. Nutritional Stats Per Serving (1 1/2 cup): 334 calories, 18 g protein, 56 g carbohydrates, 6g fat (1 g saturated), 12 mg cholesterol, 12g fiber, 180 mg sodium. Many experts recommend them, but I say start with delicious probiotic foods — then check with your doctor about supplements. Some supplements are on the market aren’t stored correctly and their cultures can die on the shelf. Prebiotics are non-digestible food ingredients (like fibers, starches, and dairy or plant sugars) that stimulate the growth of probiotic bacteria in your digestive system. Fiber which is sorely lacking in most Americans’ diet, is not only the way to “clean” your intestinal tract and prevent blood sugar spikes, but it’s also a great way to feed good intestinal bugs. Aim for 60 grams or more per day, including everyday superfoods like raspberries, blueberries, apples, spinach, and broccoli. Limiting sugars, alcohol and white processed carbs is always sage advice, but if you suffer from digestive disorders like IBS you might want to look into an elimination diet.